Search for the best flight prices from Manchester to Hong Kong. Compare prices, book today and save money with Manchester Airport. Throbbing, 24 hour Hong Kong is an eastern gem. With 7 million inhabitants filling its teeming streets, it has a buzz that never sleeps. Shopping, eating, drinking, sightseeing – and a truly dazzling night-time skyline make this destination truly unforgettable – whether you’re up in the heights or down at ground level. 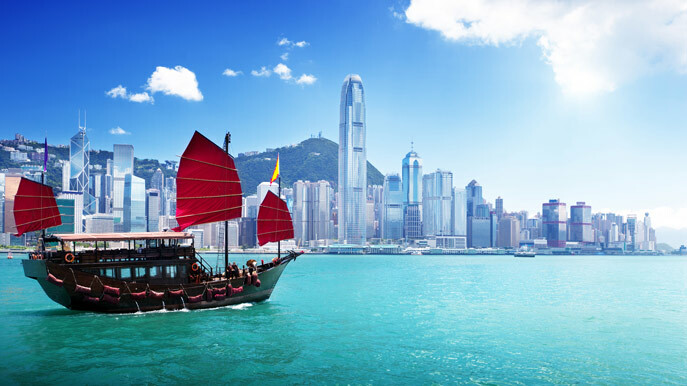 Hong Kong is one of the most visitor-friendly destinations in the Far East, and it has the hotel stock to match its popularity. The traditional luxury of five-star properties like The Peninsula Hong Kong (Salisbury Road), which still exudes a refined high-tea-and-cakes ambiance, is these days offset by the more contemporary charms of places such as Hotel ICON (17 Science Museum Road), where a rooftop pool and snappy design touches reflect a city driven by progress. For those on more of a budget, meanwhile, the stylish Cosmo Hotel Mongkok (88 Tai Kok Tsui Road) is bright and spacious, with a location just five minutes from the Olympic MTR station. Commerce has long been at the heart of what makes Hong Kong tick, so it’s little surprise that the shopping options are so comprehensive. You’ll find malls and markets in almost every pocket of the city, although the most popular areas tend to be clustered around Kowloon and Hong Kong Island itself. Hotspots such as Causeway Bay and the neon wilderness of Mong Kok play home to large, modern shopping centres including Times Square (Causeway Bay) and Langham Place (Argyle Street, Mong Kok). There’s also rewarding souvenir-hunting to be had at Hong Kong’s open-air markets – Temple Street Night Market (Temple Street) is one of the best. Hong Kong is a wonderful place to eat, with Chinese (and particularly Cantonese) food taking top billing. Visitors can take their pick of everything from budget street eats to Michelin-starred restaurants, with plenty also on offer for those who prefer sticking to Western dishes. The destination is synonymous with dim sum, small steamer baskets or plates of food served by a waiter wheeling a cart around a restaurant – Lin Heung Tea House (160 Wellington Street) is an atmospheric option. For fine dining Hong Kong-style, try the excellent Tim’s Kitchen (84-90 Bonham Strand) or the renowned Otto e Mezzo (18 Chater Road). Nothing in Hong Kong quite matches the colour, noise and crowds of its annual Chinese New Year celebrations, when fireworks, feasting and flower markets are the order of the day. It draws on traditions dating back millennia. A hugely popular event with expats and sports fans, this seven-a-side tournament has become as notable for the spirit of revelry in the stands as the performances that take place on the pitch. All major rugby nations are usually represented. Centred on the broad expanse of Victoria Harbour, this yearly spectacle draws some 400,000 spectators and more than 5,000 participants. The dragon boat races themselves are battled out in full view of the crowd. Hong Kong bills itself as the ‘Halloween party capital of Asia’, neatly showcasing its blend of Western and Eastern cultural influences. Expect costumed celebrations, themed entertainment and festive food and drink. Organised to highlight the diverse – and often overlooked – offerings of Hong Kong’s countryside, this is a chance to join free guided walks, or simply explore a side to the destination that would otherwise have remained unseen.